LUANDA, Sep 17 2009 (IPS) - A chauffeur guides a shining 4×4 BMW out of a gated condominium, ferrying a smartly-dressed executive and her three uniformed children out into another morning in the Angolan capital, Luanda. Leaving her air-conditioned office at lunch, our executive will pay $100 for lunch in a beachfront café and think nothing of spending $300 on a few items of imported food from an upmarket grocery store. A few miles away, another woman sits on the verge of a dusty street, one of many selling dented tins of palm oil and bruised tomatoes. They sit on the ground or on upturned plastic water containers, just metres from a trench of rotting rubbish. Oblivious to the stench and swarms of flies, she braids another woman's hair and watches her malnourished children play in the murky puddles nearby. Both these women are Angolan, but they will never meet nor are they ever likely understand each other’s reality. Since the end of Angola’s three decades of civil war in 2002, the country has enjoyed unprecedented economic growth – an average annual Gross Domestic Product (GDP) increase of 15 percent – thanks to high oil prices and billions of dollars of foreign investment, particularly in construction. Pumping around 1.8 million barrels of oil a day, Angola has overtaken Nigeria as Africa’s largest oil producer and become the world’s fifth biggest exporter of diamonds. But while the country has gained international recognition for its rapidly expanding economy, two thirds of its population continue to live on less than two dollars a day, according to the World Bank. 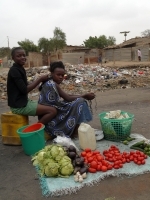 The Centre of Studies and Scientific Investigation (known by its Portuguese acronym, CEIC) at the Catholic University of Angola records unemployment at around 25 percent, but notes more than half of the population rely on the informal sector to generate income, and in rural areas most remain dependent on subsistence farming. Angola’s oil boom may have brought millions of dollars into government coffers, but it has created few jobs, and the thousands of construction sites around the country – signs that the country is rebuilding itself after many years of war – mainly use imported labour from China and other Asian countries. As a result, few Angolans have benefited from these job opportunities. According to Alcides Sakala, spokesman for Angola’s main opposition party UNITA (Union for Total Independence of Angola), the gap between the haves and the have-nots continues to widen. "What we are seeing is a small minority of people getting richer, while there is a majority of people getting poorer and poorer and poorer," he told IPS. The chasm between the rich and the poor is evident everywhere, particularly in Luanda, where beggars roam outside city centre apartments which command rents of more than $25,000 a month and land mine victims spend their days helping people park their oversized Sports Untility Vehicles (SUVs) in the hope of a few bucks for an evening meal. According to the United Nations Human Development Index (HDI), which measures citizens’ wealth, education and life expectancy, Angola is showing little sign of life improvement, despite its oil riches. The index goes from zero, meaning no human development, to one, meaning full human development. At the latest count, Angola’s HDI was 0.484, compared to 0.670 for South Africa, 0.664 for Botswana, and 0,541 as the average across all the countries in the Southern African Development Community (SADC). While there is enough money in the country to build private hospitals for those who can afford the fees, most Angolans struggle to access even basic health care, which lacks trained staff and infrastructure, particularly in rural areas. And while private schools rake in astronomical fees to educate the children of the elite, one third of the country’s children are outside of the school system. Many are kept at home to work to support their families. Douglas Steinberg, country director for Save the Children in Angola, explained: "There is an enormous gap between the rich and the poor here, and a lot of people are not really aware of how rich Angola is. People who live in the rural areas or central areas, they don’t see the oil rigs offshore, they don’t know just how much money is there, they don’t see all the new construction and the flash cars and expensive restaurants." "And I think this is part of the problem – if people don’t know how wealthy the country is, it’s harder for them to hold the government to account for how it spends that money," he added. In its 2008 Economic Report, CEIC noted a continuing level of poverty, which was in direct contrast to the country’s growing wealth. "GDP increased fivefold from 2003 to 2008, from $959 to $4961 in 2008," the report said. "But despite this, the large majority of the population remain in a permanent state of poverty, having to survive on little more than two dollars per day." Sister Domingas Loureiro, runs a charity that helps poor families in Luanda’s crowded Cazenga neighbourhood, a maze of self-built homes with no electricity and little access to water or sanitation. "People here are literally fighting to survive and many children are being forced to work from a young age. The reality of life and the level of misery in these bairros is not something the government really knows about," she said. Angola’s president Jose Eduardo Dos Santos, however, claims to know about the poverty in his country. In March, during a speech alongside Pope Benedict XVI, Dos Santos, who marks 30 years in power, acknowledged the "tremendous challenges" the country faces to overcome poverty and unemployment and pledged continued investment to address them. During the visit of United States Secretary of State Hillary Clinton to Angola in August, foreign minister Assunção dos Anjos was asked by a Washington Post reporter to explain how Africa’s largest oil producer scored so low on the HDI. The minister responded by saying: "Give us time to resolve this problem. We have mechanisms, we have the will and we have the structures to be able to guarantee to our people that they can live in dignified conditions. Unfortunately poverty can’t just be overcome by waving a magic wand." For the estimated five million Angolans who live in slum conditions around Luanda, a magic wand may seem like their only hope.